A Saturday with the kids. We don't really have a kids program anymore but we do know some great kids. 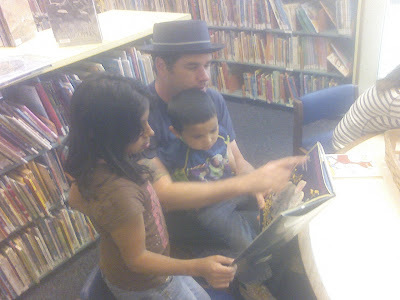 This past Saturday, we took some of them to our local library for a magic show and some reading together. There are few better ways to spend personal time with a kid than experiencing a story together. I'm thankful for Manuel and Alexa who came along with Aaron and I to make the day possible. 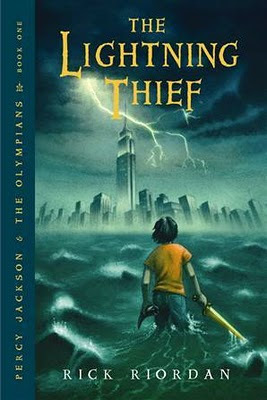 "Percy Jackson and the Olympians: The Lighting Thief" is the story about a kid who has been kicked out of almost every boarding school in New York. Life does not seem to be looking up for Percy right now, until he finds out he is a demigod (half mortal, half god). So, he flees to Camp Half-Blood where he finds he is the son of Poseidon, the god of the seas. If that weren't enough, taken directly from the back of the book, "Zeus's master lighting bolt has been stolen and Percy is the prime suspect". Now Percy must find the bolt, clear his name and find the real thief in ten days. There are a lot of differences between the book and the movie. The hydra fight in the museum in the film was like the castle siege in the Prince Caspian film, it was disappointing because I really wasn't expecting them to add extras. This is Chris Columbus, the guy who made the first two Harry Potter films which were, of all the the Potter movies, closest to the book. And, in the book, there was a big 'ol fight with Ares, the god of war, that I would have liked to have seen in the film. All in all the movie was very far apart from the book. 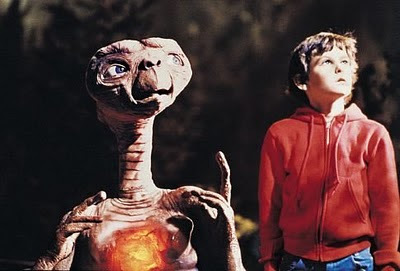 I liked the book more than the movie because there is a deeper story. It gives you a sense of "oh no, what are they going to do next!" I think you would like it. Give it a try! My Grandfather was one of the funniest people I have ever known. To call him Grandfather feels weird. We called him "Popo" because the first grandchild picks for everybody else. My Grandmother was consequently "Momo". He was also the hardest worker I have ever known. For years, he worked as a rigger (that's welding and construction at very high heights) for Louisville Gas and Electric. 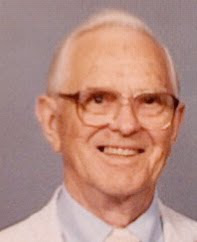 In younger years, to save money so he could marry my Grandmother, he hitch hiked to Detroit to get a job in a factory when work opportunities in Kentucky were scarce. He was too young for the draft in WWI and too old for WWII (he also had flat feet) and so he worked in ship yards building for the navy. He always had a huge garden. It was way too big for his family to consume all the produce so they canned the excess as well as shared it with their church community on Sunday mornings. Popo was a year away from full retirement benefits at his company when he had a terrible accident. He was working on the roof of a building and slipped off, falling several stories. He told me that he remembers thinking as he was falling that he didn't want to just land, he wanted to land with a purpose. So he twisted himself around so that he would land on his feet, giving him the chance to roll quickly over and minimize the damage to his body. The impact immediately broke both of his heels but he did manage to roll when he hit. Being just months away from full benefits, his boss could have let him go because of his disability. There was no way he could continue his work. He would have lost everything. But, it was a different time. Somethings were more important than the bottom line. His boss told him that he expected to see him at work until he qualified for full retirement. Popo did just that. He came in everyday and made coffee for the guys, cleaned up and did what he could at the work sites. And later that year, retired with full benefits. A great book you've never heard of. 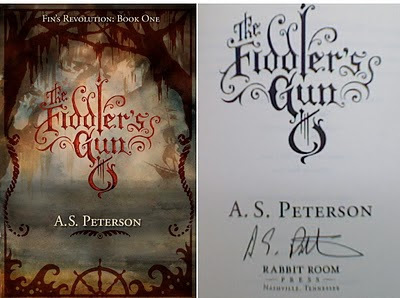 So here is my recommendation for this book, The Fiddler's Gun by A.S. Peterson of Rabbit Room fame. "The Rabbit What? ", you may ask. The Rabbit Room (rabbitroom.com) is a communal website hosted by Andrew Peterson and friends. Named after the room in the Eagle and Child Pub where Tolkien, Lewis and others of the famous "inklings" met to drink, talk, argue and laugh. The virtual Rabbit Room is just that, a group of friends who are also artists sharing common discussion about culture, stories, music and faith. 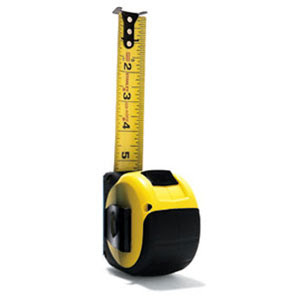 If you like blogs, this is a fun one to add to your reader. It's a great place to find out about some good music, books and film that you may have otherwise not heard of in the current atmosphere of big advertising where the thing with the most bucks behind it's publicity is the thing you hear about. Through the Rabbit Room I discovered that A.S.(aka Pete) Peterson was writing his first novel and letting the public in on the process through a website (http://thefiddlersgun.com). I was intrigued by his ideas for the story and began following his progress at the site and through Twitter. This was a fun build up to the release of the book...we got to experience the author's frustration, uncertainty and joy and most things in between. He opened himself to those of us following and I can't decide if it made me want to try my hand at writing a book or never, ever attempt anything so vulnerable. I guess time will tell. So, when it's all said and done, did the story deliver? After following the process so long, I was pleased to be able to buy my book right from Mr. Peterson's hand (notice the signature in the picture above) at the Ryman Christmas concert (where many Rabbit Roomers were lurking about) of Behold the Lamb of God. Well, there were a few books in my way but finally, I read it. This is one of those stories that you never tire of hearing. It carries with it, in the best way, echos of stories you love to wrap yourself up in and marinate in the language. Beautifully told, this is the story of a girl, who is all of us, finding out who she is destined to be. It's a story of redemption, not in spite of but through mistakes, misunderstandings, pride, foolishness, heartache, courage, friendship and love. In The Fiddler's Gun, we follow Fin Button, an unwanted orphan girl coming of age in the time of the American Revolution through real danger, difficult choices and narrow escapes. This is not a children's book, the story sees Fin through some very dark and scary places (I recommend it for teens on up) and it is well worth the journey. Peterson writes riveting action sequences that keep you reading way past your bedtime. And what I loved most about the book is the deceitfully simple beginning that matures into a well woven tale of unfolding mystery (wow, I should write movie trailer copy). And I can't wait to read the conclusion in the forth coming "Fiddler's Green" which according to the Twitter updates is past chapter 17. "...time has a way of leading a person along a crooked path. Sometimes the path is hard to hold to and people fall off along the way. They curse the road for it's steep grades and muddy ruts and settle themselves in hinterlands of thorn and sorrow, never knowing or dreaming that the road meant all along to lead them home. Some call that road a tragedy and lose themselves along it. Others, those that see it home, call it an adventure." A quick update with some links for your perusal from the Whitlers in Modesto, Ca. In our last update, I mentioned that we were hosting a team from Global Youth Network in Canada. Every year a group comes to spend a week of leadership training with us. This year the team was smaller than usual, only 4, and we had a great time together. We are looking forward to a return team from Global in the summer as we partner together for Camp Awesome. Global will help us take some inner city kids to the coast for a 4 day camp experience. We can't wait! Read more about the recent trip HERE. Toward the end of February, our family and Aaron were able to spend a day with Amy and Jeremy who are pioneering Youth With A Mission in Sacramento. There are several YWAM locations near to us and we would like to be better connected to the mission. YWAM Sacramento has a similar heart to ours here, seeking to minister alongside the local church, providing opportunity, using creativity and imparting those passions that God has given us to others. They have a special desire to see the Latino community in their city released into missions. Find more about YWAM's work in Sacramento HERE. While we seek to serve as many church communities as we can, we do have a unique relationship with New Hope Christian Fellowship. I lead the worship team and serve on the youth team. Aaron and I are also deacons in the church. Earlier this month, we had a church leaders retreat in the foothills of the Sierra's. This was a wonderful time of connecting, sharing and praying with one another. We did not have an agenda for this retreat but just let God set the days and it was so good. We came away refreshed and knowing one another so much better. On the family front, we're doing great. Spring has sprung (as it always does) a tad early here in California. This past weekend, we took the kids to the annual Celtic Faire in Sonora and had a great time together in spite of the rain. We saw real jousting, shot arrows, deployed a real trebuchet, listened to some great Irish music and ate some good ole fair food. You can see some pics from our day HERE. Please pray for our friends and fellow YWAM workers, the Sustars in Thailand working with Compasio. They will be there for one more month. You can read more of their adventures HERE. Also, pray for us as we gear up for 3 visiting teams in the next month. One of those teams is John Wason from YWAM Canada's Word To Life Theater Arts (click HERE for more info). We are currently setting up a local tour for him. If your local Modesto area group or event would like to book John, let me know! Also, please continue to pray for our continued weekly outreach on South 9th Street here in Modesto. Support - If you would like to support our work financially, all donations are tax deductible when made out to YWAM and sent to: YWAM / P.O. Box 3000 / Garden Valley, TX / 75771-3000. Our name must not appear on the check, but include a separate note stating the gift is for the Whitler's work in Modesto, CA. Tron, Kenosis and the fabric of the universe. This past Saturday, Josh, Sam and I went to our local library for a viewing of the 1982 film Tron which was one of the first to utilize computer graphics as a major part of the story-telling. After seeing Avatar late last year...well, let's just say we've come a long way. How long has it been since you've seen Tron? I haven't seen it since it was on video and I was still plunking quarters into the Tron game at the Arcade on Sunday afternoons. 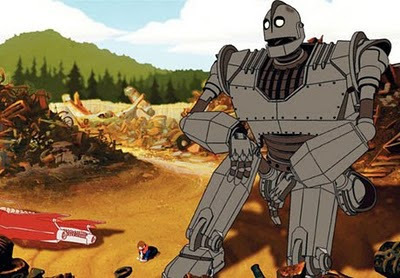 While not the greatest film in the world, it's value is more in the nostalgia than anything. And because of the nostalgia, Tron 2 will hit theaters in December of this year. Josh, Sam and I were the only ones to show up to watch the whole thing along with the nice library lady who turned on the projector and made us popcorn. But as we watched, I was stuck anew by an element my friend Brad used to talk about in our YWAM Discipleship Training Schools in Canada. About how many stories, and this shows up a lot in sci-fi, carry similar elements. How there is a story that we do not tire of telling in our books, movies, plays, shows and songs. 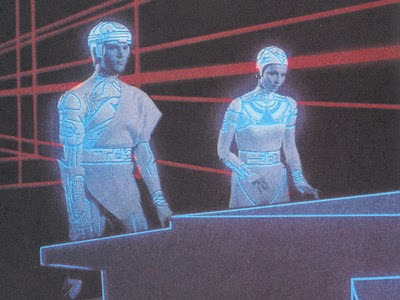 In Tron, Flynn, a "user" from the real world gets sucked into another reality, a reality he helped to create. Flynn finds in this alternate world that things are amiss and he is caught up in an effort to set things right. Flynn is the only one of his kind. The rest of the inhabitants of the computer world are created programs but Flynn is a user, a creator. Flynn finds that he can heal, he even brings a program back to life. 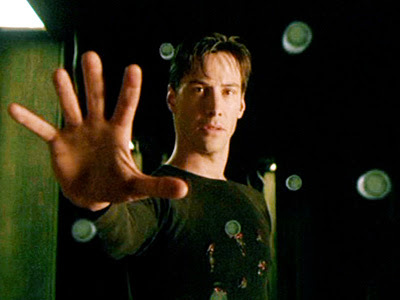 And in the end, he realizes that he must give of himself, by jumping right into the heart of the evil Master Control program in order to absorb his nature and through a Resurrection of his own, he resets the computer world as well as things gone wrong in the real world. A recent interview I heard on the NPR show, "Speaking of Faith". In an episode called "Science and Hope" (which you can listen to HERE or read HERE), South African Quaker cosmologist George Ellis talks about a principle he has observed in the universe that he calls Kenosis. It's a Greek word that means "letting go, giving up or emptying out." Dr. Ellis talks about how this counter-intuitive "losing to win" is at work in many different ways in nature and in our experience. Parents giving up to see their children thrive. Gandhi and Dr. King as modern examples of literally absorbing pain and suffering, and in the act, a certain system of oppression is reset, made right. 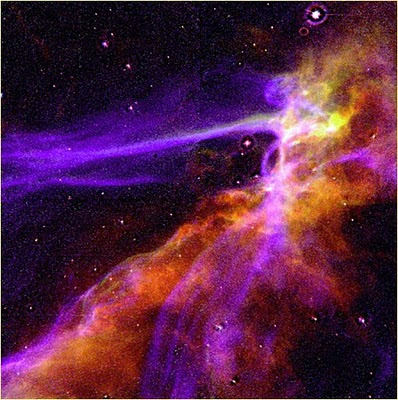 When a star dies, it goes super nova and in a last great cataclysm, throws off the stuff that forms new stars. New life in the rain forest sprouts from the dying matter beneath it. New life, resurrection, redemption all come from losing, letting go, emptying out, dying. And all that reminds me a lot of...well, you get the idea. 'twill be the old, old story that I have loved so long." There seems to be a unique process for those of us who grew up in church and a Christian home. Well meaning folk (Sunday School teachers, preachers, etc.) all my life have given me a few unworthy God concepts to work out (lots of good ones too). I specifically recall one Sunday school teacher talking to me and my 7 or so peers in our junior high boys class about God not approving of being funny or telling jokes as it is "idle talk". He told us how one day, we will stand before God and give an account for every silly thing we said. Whoa! On our resent church leaders retreat, we talked a little about our different views of a common debate between denominations. Are you "once saved always saved" or can you "lose your salvation"? This question can be quite a hot button and really, I'm not trying to start a debate here about it. But during the discussion, I had a little personal revelation. When pressed to give an answer on where I fall, my only answer could be, "This is the wrong question." For one, this is a doctrine that scripture does not ask me to have a position on. Scripture assumes that I am walking with God in relationship (I mean, I'm reading aren't I?). There are stories that warn me of the dangers of getting off track, there are stories of restoration and God's power. And in all of it, it is a huge story of how big God is, how small I am, and how trustworthy He is. And that God is, at his very essence, Love. And that there is no fear in love. So if I am at the point of asking the question whether my salvation is secure, then I'm probably doing ok. Like, if you're worried you've committed the unforgivable sin, you probably haven't. Because if you have, you wouldn't care. So I do not have to fear admitting that I, in relationship with God, have a little something to do in that relationship. "'Abraham believed God and it was counted to him as righteousness' and he was called God's friend" (James 2:23). God loves when I reach out to him in freedom and contribute to our relationship. He responds to me! Li'l 'ol me! And in that, I do not have to fear admitting that I am secure in him. He is so much bigger than me and I do not have to fear that a misstep will turn all heaven against me and doom my mortal soul. I do not have to fear that I am so all important that I can fall off the salvation wagon so easily. I have a daughter and one day she will probably be so mad at me that in a fit of emotion says "I hate you!" But I'm her Dad and while it may sting a bit, I really know the score. I'll know that she is my daughter and that she really loves me but doesn't see things so clearly right now. I will know to be patient and wait for her to come around. My daughter and her thoughts and feelings are important in our relationship, but mine are more important. I'm the Dad. In a much bigger way, God is the Dad and what he knows is way more important than my limited perspective. It seems that so much of Christian culture is based in fear...fear that we are not doing enough, not learning enough, not reaching enough, not "right" enough...never enough. And while there is an element of discipline, pressing in and stretching in our walk, it can never be because of fear. These things grow out of love...pressing in to God because we are in love with him. No lover ever has to be guiltily convinced to spend time with the beloved. In love, there is no end of things to talk about, experience together and learn of one another. So, not in love? That's ok, you might be afraid of God. He can handle that. But get beyond your fear and start a relationship with him. Relationships are dynamic. They start slow, maybe a little awkward at first, then friendship grows with shared time and interests, then intimacy develops and before you know it, love is in full bloom. There is no fear there. It is dynamic, you both have a part to play. It is secure, God is big and his love is enough. To You all men come." Hear my running, tired, ragged, joyful, imperfect, crude, reaching, searching, distracted, tearful, laughing, disjointed, funny prayer.